In a historic feat, astronomers announced on Wednesday that they have captured the first-ever image of a black hole in a distant galaxy — the biggest tribute to the late Stephen Hawking who theorised about the existence of black holes emitting radiation in the universe. The image — taken by a network of eight telescopes across the world — shows luminous gas swirling around a supermassive black hole at the centre of “Messier 87”, a massive galaxy in the nearby Virgo galaxy cluster, the European Southern Observatory (ESO) said in a statement. Described by the scientists as “a monster”, the black hole resides 55 million light years from Earth and has a mass 6.5 billion times that of the Sun. “We have taken the first picture of a black hole. This is an extraordinary scientific feat accomplished by a team of more than 200 researchers,” said Sheperd S. Doeleman from the Center for Astrophysics at Harvard and Smithsonian and Event Horizon Telescope (EHT) Project Director. The EHT is a global network of radio telescopes that work together as one virtual, Earth-sized telescope, with a resolution sharp enough to “see” a black hole’s shadow. “If immersed in a bright region, like a disc of glowing gas, we expect a black hole to create a dark region similar to a shadow – something predicted by Einstein’s general relativity that we’ve never seen before,” explained Heino Falcke of Radboud University, the Netherlands. Multiple calibration and imaging methods revealed a ring-like structure with a dark central region — the black hole’s shadow — that persisted over multiple independent EHT observations. 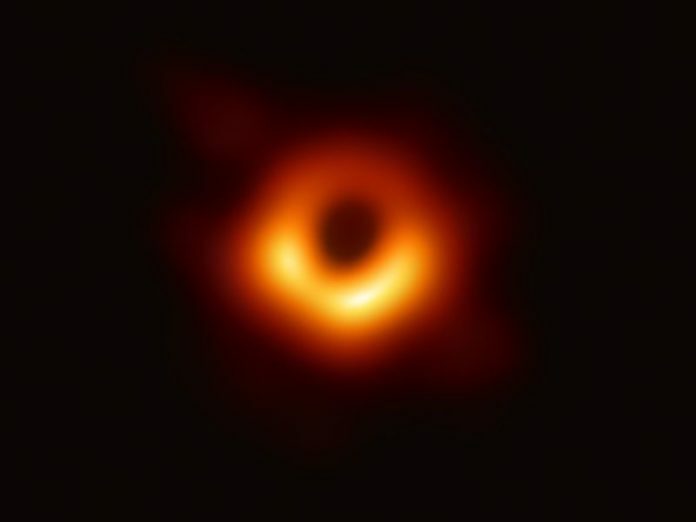 According to the EHT, the black hole’s boundary — the event horizon from which the EHT takes its name — is around 2.5 times smaller than the shadow it casts and measures just under 40 billion km across. “The confrontation of theory with observations is always a dramatic moment for a theorist. It was a relief and a source of pride to realise that the observations matched our predictions so well,” elaborated EHT Board member Luciano Rezzolla of Goethe Universitï¿½t, Germany. “We have achieved something presumed to be impossible just a generation ago. We have taken a picture of a black hole,” noted Doeleman.